Blue Bottle Comes To HanaHaus,.. In Paris, A Collaborative Roas..
Coffee, too, is undergoing a renaissance in Cleveland. Almost gone are the coffeehouses of my youth, where when you ordered a Café Mocha what you got was from a prefab milk mix, steamed to order. Today, there is coffee to please every palate within an area that spans about six city blocks to the east of Public Square. Without stopping to sample each cup along the way, a walker could pass more than half a dozen businesses that sell specialty coffee in about 30 minutes of strolling. All are part of the long-simmering revitalization in the city’s downtown core. Let’s take a quick tour. The second-longest operating coffee business in downtown Cleveland opened its retail location in February as part of the new Downtown Heinen’s. Equal Exchange, founded in 1986 and headquartered in West Bridgewater, Massachusetts, is one of the shops-within-a-shop at the first downtown location for Heinen’s Grocery Store. The new flagship grocery opened in February in the historic Cleveland Trust Company building at 900 Euclid Avenue, and the Equal Exchange Espresso Bar is just inside the Euclid Avenue entrance. Heinen’s itself has a long history in the Cleveland metropolitan area. From its first store, a butcher shop opened in Shaker Heights in 1929, the company now has more than 20 stores. André Bacsa, café manager at Equal Exchange Espresso Bar, says the three-month-old retail location is very busy on Fridays, Saturdays, and Sundays. So far, weekday regulars tend to opt for the largest size of drip coffee available in the mornings and typical espresso bar beverage later in the day. 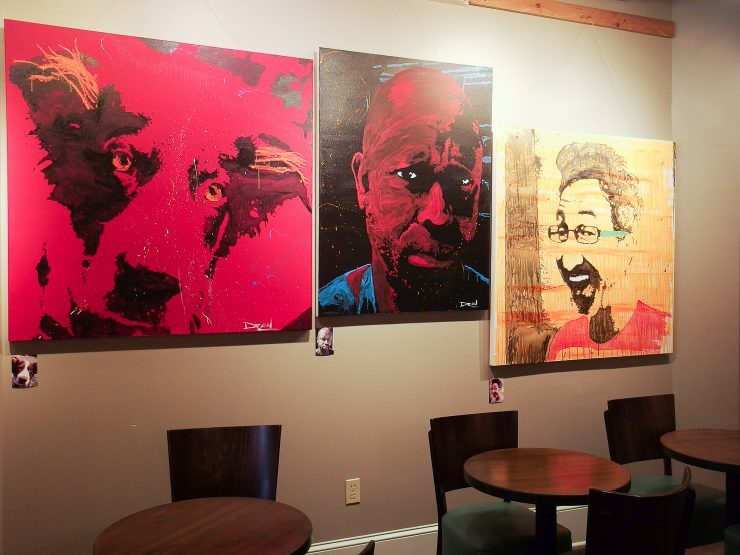 Recommendation: Stop in for an afternoon macchiato and head upstairs for a closer look at the murals while perusing the wine and beer section. 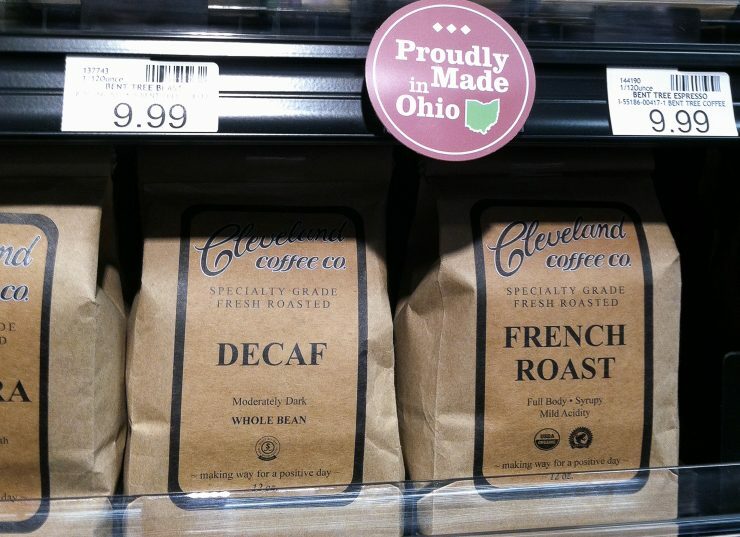 Equal Exchange Espresso Bar in Heinen’s Grocery Store is located at 900 Euclid Avenue, Cleveland, Ohio. The newest entry to the downtown coffee scene is Vintage Tea & Coffee at 1816 East 12th Street. Jeff Su, the proprietor, grew up in Taiwan and arrived in Cleveland for college after finishing high school in North Wales. Growing up in Asia and the UK gave him very solid grounding in fine teas and tea culture. However, with the recognition that a standalone teahouse might be a hard sell in Cleveland, he applied what he had learned earning a business degree from Cleveland State University towards retooling his first idea into plans for a tea and coffeehouse. Su admitted he knew almost nothing about coffee except that he “…never thought coffee could be so good…” before discovering Rising Star. Gary Kim Jenkins, owner of Rising Star Coffee Roasters, trained Su in the ways of Third Wave coffee. Su now serves Rising Star at Vintage’s full-service coffeebar, fitted out with a Synesso Cyncra, pour-over bar, Marco EcoBoiler and Mahlkönig EK43 and K30 grinders. Su now offers intimate special events—like latte art—to spread what he has learned to his regulars or anyone lucky enough to get one of the six slots available. Su intends to alternate the events’ focus between coffee and tea. If you are or will be in Cleveland, watch the Vintage Tea & Coffee Twitter and Facebook accounts for special event announcements. Recommendation: Go for the coffee but stay for the tea! Vintage Tea & Coffee is located at 1816 East 12th Street, Cleveland, Ohio. Aside from employing a world-class soprano, Phoenix Coffee Company has another claim to fame: after Starbucks, it is the third-oldest coffee retailer operating in the downtown core and the only one founded in Cleveland. They also are frequent hosts of the Thursday Night Throwdown, a semi-regular event that many credit for paving the way for a Third Wave coffee scene to develop in the area. Recommendation: Skip the in-and-out morning crowd to enjoy the new décor at the East 9th Street location. Midmorning or midafternoon on weekdays are a great time to get a latte and linger. Phoenix Coffee is located at 1700 East 9th Street, Cleveland, Ohio. Brendan Walton opened A.J. Rocco’s at 816 Huron Road East in the Caxton Building in 2001. Backed by the same group of private investors, he also started a coffee roasting business, the Cleveland Coffee Company. Walton’s team uses a seven-kilo Sasa Samiac to roast about a dozen products at the roasting facility in the nearby St. Clair-Superior neighborhood, including single origins, estate, and blends. Walton said, “We roast 10 single origins, estate and coop, and offer two blends at this point. All [Cleveland Coffee Company] coffees are available and rotate daily at A.J. Rocco’s.” Walton’s coffee, like Erie Island Coffee Co. and that of many other roasters in the region, also grace the shelves of the Downtown Heinen’s. Recommendation: Visit on a Tuesday for a brewed coffee special, and if you like it, buy a bag then and there. Moran, one of the principals who spearheaded creating East 4th Street, has an interest in coffee too. He’s part of the ownership group for Erie Island Coffee Co., which happens to have opened its flagship store on East 4th in 2009. This café is situated right in the middle of the East 4th Street restaurant row. The address for Erie Island Coffee Company is 2057 East 4th Street, but what you really need to know is that from the Prospect Avenue side, the coffee house will be on your right about midway down the block. Erie Island can draw crowds for breakfast and lunch with a menu that features seasonal food items in both categories. There’s a slower vibe to midmornings and midafternoons here, as you’d expect for a restaurant located in an area popular with locals and tourists alike. The arrival of the drinks-and-dinner crowd brings a bustle to this pedestrian-only zone. Recommendation: Try an iced coffee or a frappe on a lazy summer afternoon and grab a seat outside to indulge in some people watching as the evening crowd starts to arrive. Erie Island Coffee Co. is located at 2057 East 4th Street, Cleveland, Ohio. Not yet a year old the first time I visited this winter, it was obvious I’d walked into a Third Wave shop. Here is a coffee bar properly prepped to handle multiple pour-over orders at once with room for as many as eight Hario v60s going at once. On my most recent visit, I indulged in a Cleveland Bagel Company bagel and a Rwanda Kibuye Valley Gitesi by Sweet Bloom Coffee Roasters as a v60 pour-over. Recommendation: The coffee and community are excellent here. Go ahead, order that Chemex and strike up a conversation. Pour Cleveland is located at 530 Euclid Avenue, Cleveland, Ohio.